Crow Pass and Eagle River Traverse was supposed to be our next 26-mile backpacking trip in Alaska. The rain forecast, however, precluded us from completing this as our gear was still soaked from our Resurrection Pass backpacking trip for the last four days and it was supposed to continue for the next three. We needed time to dry out our stuff which wasn’t in the plan, so we made a new one. Instead of backpacking and crossing the river, we took a day hike up to the pass to view the nearby glacier. I think a day hike turned out to be a better option as I later found out from my fishing guide that he thought the river might have been too dangerous to cross with all the rain. 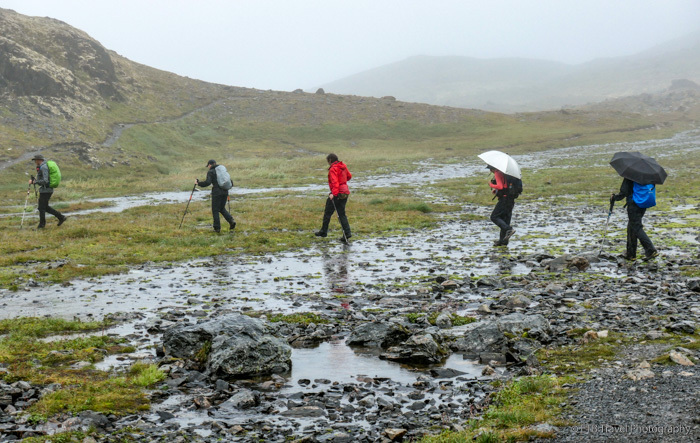 The trip was planned in August which we knew was the rainy season to give the river time to drop from all the snow melt, but it has been an overly rainy/windy season for Alaska this year. Our 8-mile roundtrip hike began beneath overcast skies which soon dropped a light drizzle upon us as we climbed the steep trail lined with bushes of salmon berries. Soon the path led us above treeline to old mine ruins. Monarch Mine was a hardrock gold mine that operated from 1906 to 1948. From the mine, we carried on to Crow Creek cascades which were spectacular. I didn’t realize how large they were until Bojan stood next to them, and he looked like a large ant from a short distance away. From the waterfall, we scrambled up the shale to reconnect with Crow Pass Trail where we hopped from rock to rock across two tumbling waterfalls and then danced across a wet mossy area as we slowly came upon the pass enveloped in fog. Just on the other side of the pass, we descended toward the base of Raven Glacier where we had hoped to have lunch and enjoy a nice view. Instead, the cold breeze encouraged us to backtrack and take cover in a nearby gully. looks wet – but still pretty. Some very beautiful photos you got there.